We’re excited to hold the giveaway of a renowned software ‘SUPERAntiSpyware PRO’ once again as a gift for upcoming holidays. SUPERAntiSpyware was recently updated to version 5.6 which is the first significant update since 5.0. 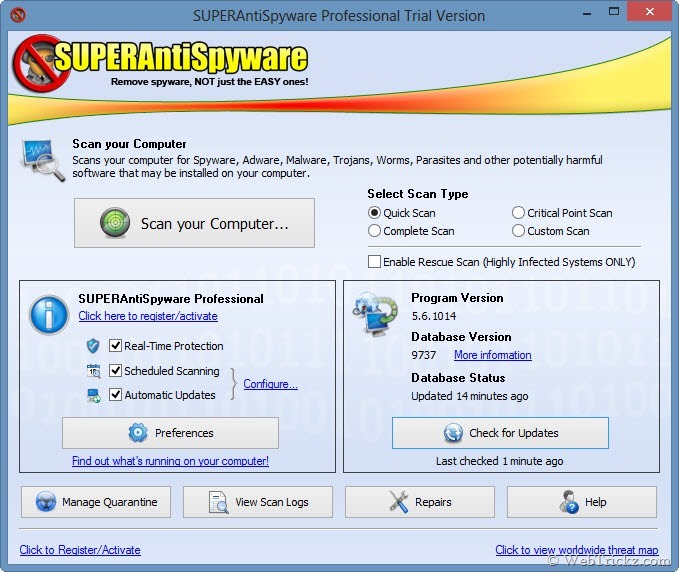 To make it more interesting, this time we’re offering 30 free license codes of SUPERAntiSpyware Professional Edition sponsored by Support.com, which actually costs $29.95 each. SUPERAntiSpyware is an efficient program with an intelligent system to detect and remove malicious stuff existing on your computer in the form of spyware, malware, adware, Trojans, worms, key loggers, hijackers, rootkits, and rogue security software. It’s highly intended for power Internet users who are most concerned about online security and privacy. However, this software is not meant to replace your existing antivirus solution but can be rather used as a supplement over it. 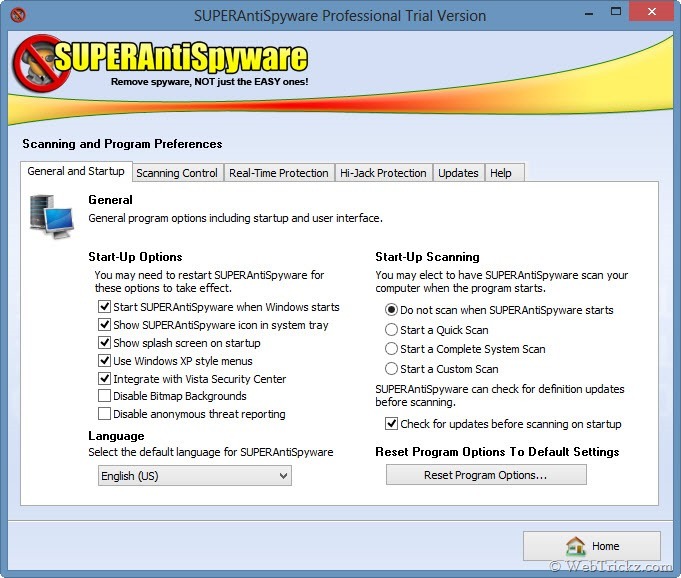 SUPERAntiSpyware comes in 2 edition – Free and Professional. With SUPERAntiSpyware, one can quickly scan their computer’s hard drive, removable drives, Registry and more for potentially harmful threats and software. It offers 3 scanning options – Quick, Complete and Custom Scan, and also integrates in right-click context menu, thus letting you scan specific files/folders directly in Windows explorer. The program offers real-time blocking of threats and is fairly light on system resources to prevent your computer from slowing down. It can repair broken internet connections, desktops, registry editing and also offers a variety of customization options accessible via ‘Preferences’. The detected threats removed are backed up/quarantined to prevent accidental removal of items which you can restore or delete afterwards. The Pro version is regularly updated in the background with latest definition updates and the free version can be manually updated easily in 1-click. Installs in blink of an eye, i.e. in just one single click. SUPERAntiSpyware Portable Scanner is also available that features complete scanning and removal engine to detect AND remove over 1,000,000 spyware/malware infections. The scanner contains the latest definitions, means you DO NOT need internet access to scan and clean the infected system. GIVEAWAY – We’re offering 30 Free 1-year Licenses of SUPERAntiSpyware Professional that are eligible for upgrades during that period. 30 Winners will be chosen from the comments section below and results will be announced on Dec 26. I could use the paid edition of SuperAntiSpyware fer shure. I would really like to have a free paid license for this great program! I would like to win a license. Please count on me. Note: All approved entries made initially thorough the Rafflecopter widget will also be included in the giveaway. Thanks for giveaway SAS is one of the best anti spyware currently i am using and my license is going to exp so i want to continue with SAS i like also scan feature which is depend upon you like speed scan and normal scan and it is also very affected on the spywares this is very necessary to should be installed because now a days computer not only for fun it our privet dairy and no one want to read any unknown person without you permission that time SAS give full protection to your privacy i also recommended this to all person who want keep data safe from unknown users. Thanks for this Awesome Security Giveaway. Wish to be the Lucky One! Superantispyware is a great product, very effective. super software but hits performance when scanning…..thanks for the giveaway…..me in!! security. Please count me in. Thank you Mayur, I received my license. Thank you for giveaway. please count me in. SuperAntiSpyware is just what it implies Super so count me in please and thanks. Hmmm interesting, this could be worth a try. I’m inn for the draw. wonderful chance to have a License. please count me in. thanks. SAS is among the best security for tackling malwares outside there. Give me a chance to win the license key..
Best giveawy on your 4th anniversary Webtricks,keep rocking ! Thanks for the pro version with realtime protection important to not get infected. Thank you very much for this. Now I have the ‘full’ version.